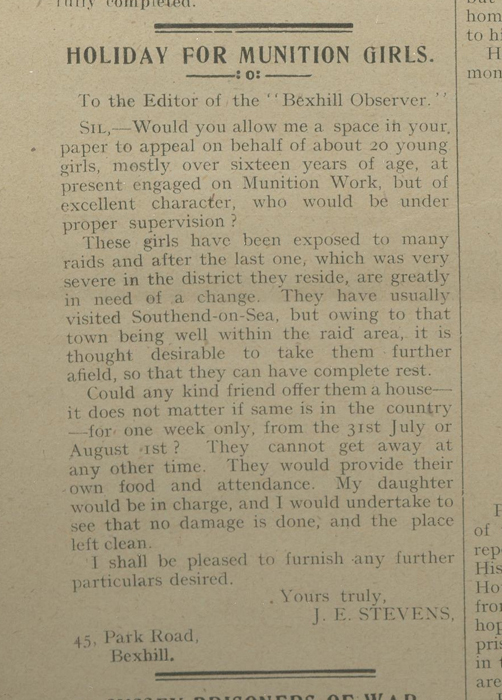 The need for ammunition and weaponry on the front lines during the First World War led to huge numbers of women, including many in East Sussex, entering new, previously inaccessible, workplaces. At the outbreak of war in 1914, Britain lagged behind Germany in most forms of arms manufacture. They had only 300 machine guns compared to Germany’s 2,400 and 5,000 tons of explosives against Germany’s 14,400. They exceeded Germany only in numbers of rifles, possessing 100,000 whilst Germany held 43,200. In order to successfully fight a major European war, Britain would need to massively increase its armament output. It soon became clear however that demand would far outstrip supply. Between the end of August and beginning of October 1914, the British army ordered more artillery pieces than they had for the previous ten years. The expected (and required) ammunition output from the major armament firms in possession of government contracts was 176 million rounds. They delivered 3 million. By June 1915, production of all major weapons was running at a shortfall. What compounded this shortage of weapons was the fact that many shells were poorly made and liable to either not go off or, on occasion, explode within the gun barrel; damaging the weapon and potentially killing the gun crew. This was the beginning of what became know as both the ‘Shell Crisis’ and the ‘Shell Scandal’. The lack of reliable weaponry was hampering Britain’s attempts to wage war and, according to military figures, costing British soldiers their lives. The political fallout from this saw furious stories printed in The Times and The Daily Mail, cost Lord Kitchener many of his powers as Secretary of State for War, and brought down the Liberal government of the time. From the ashes of this crisis emerged the newly created Ministry of Munitions headed by David Lloyd George. This new ministry acted to standardise ammunition production across the country and bring large swathes of Britain’s industry under state control. Companies and factories that had no previous experience in making weapons were redirected into war work. However, to make all of this successful, these factories would need workers. Kathleen Hamilton Beard and Dorothy Beard were the daughters of Thomas and Elizabeth Agnes Hamilton Beard. As well as Kathleen and Dorothy, there were also two other daughters, Agnes Violet and Rosalind Silver and a brother Thomas William. They lived at Rosemont, 18 Linden Road, Bexhill and according to the 1911 Census they also took in boarders. Kathleen and Dorothy ‘s occupations were listed as private governesses. 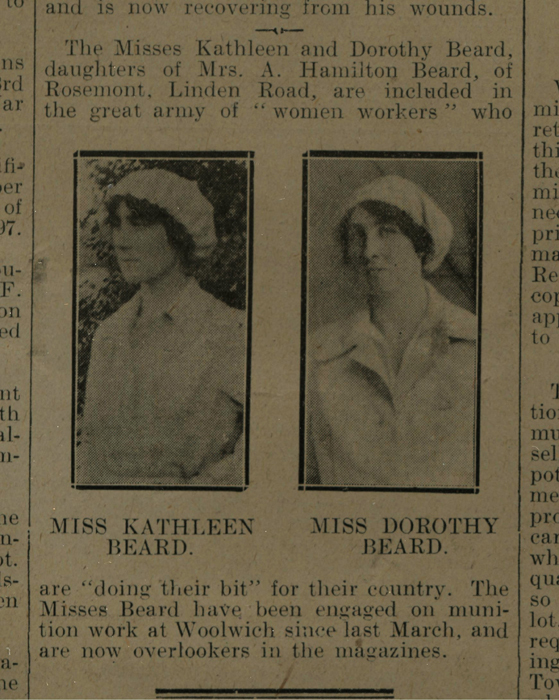 During the First World War, the local newspapers reported that Kathleen and Dorothy were working at the munitions factory in Woolwich. They had worked there since March 1916 and by November 1917; they were overlookers in the magazine. 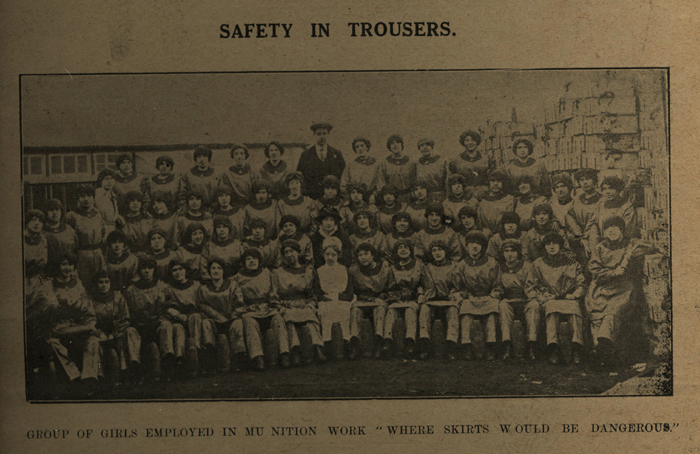 Women who worked in munitions factories were known as “munitionettes” and became the most visible face of women’s war work. Some were also known by the nickname “canaries” because of the yellow tinge of their skin, a nasty side affect of being exposed to sulphuric acid and other poisonous substances. The Royal Arsenal at Woolwich covered 1,300 acres and employed approximately 80,000 people. There were various factories on the estate, including the Royal Gun Factory, the Royal Shell Filling Factory and the Research and Development Department. In order to cope with such as large workforce in 1915, the government built the Well Hall Estate at Eltham which provided 1300 new homes for the munitions workers. The new Ministry of Munitions regulated hours, wages and conditions, as well as forcing the factories to employ more women in order to release more men for the Front and to provide a workforce following the labour shortages. 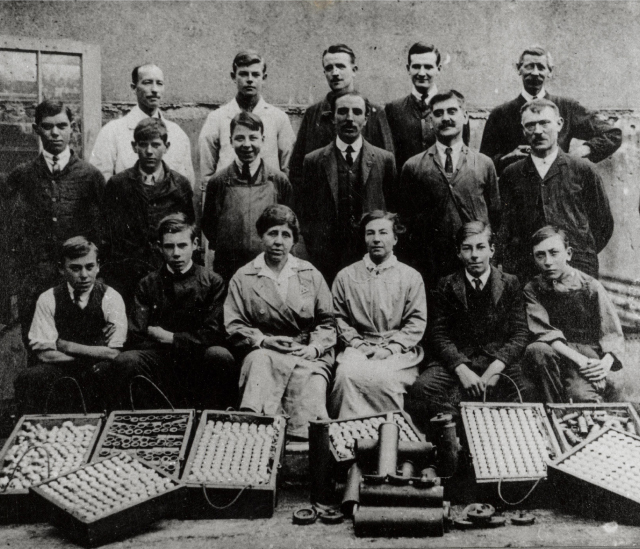 By 1917, Munitionettes were producing 80% of the weapons and shells used by the British Army during the War. They risked their lives daily working with poisonous and explosive substances wearing inadequate protective clothing. On several occasions the explosives ignited killing and injuring workers. In 1917 the Silvertown explosion killed 73 people and injured over 400. Women were also paid only half of the men’s wages who did the same work. Despite campaigns by the Women’s Trade Union League, by the end of the War their pay remained the same.